Trump Picks Dr. Scott Gottlieb For FDA Commissioner : Shots - Health News Gottlieb is seen as a mainstream pick for an agency that oversees a quarter of the U.S. economy, including pharmaceuticals, medical devices, food, cosmetics and other areas of human and animal health. Scott Gottlieb, FDA deputy commissioner for policy, speaks to reporters at the Reuters Health summit in New York in 2005. An internist and hospitalist, Gottlieb has played leading roles in various government health agencies, including as deputy commissioner for medical and scientific affairs at the FDA during the George W. Bush administration. Before that, he was a senior policy adviser at CMS working on the implementation of Medicare's then-new drug coverage for seniors. 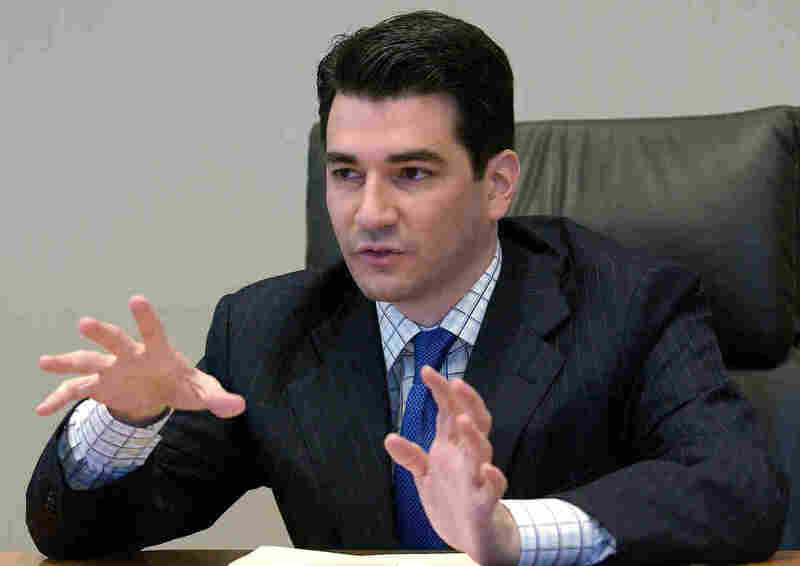 Gottlieb is a prolific writer on health care issues, particularly the pharmaceutical industry. He is seen as a strong supporter of that industry and has championed deregulation. "I think Scott is absolutely qualified," lawyer John Taylor of Greenleaf Health tells STAT. "He has good professional credentials and personal integrity, and a track record that shows the ability to make difficult decisions." While Trump has promised at various times to make fairly radical changes at the FDA, Gottlieb is a seen as a conventional choice for commissioner by a Republican president. Earlier in the year, odds were favoring the nomination of Jim O'Neill, an associate of Silicon Valley entrepreneur and billionaire Peter Thiel, a close Trump adviser. O'Neill created waves when he called for drugs to be approved as soon as they had been judged to be safe but before they are proved to be effective, as required under current law. Should Gottlieb be approved by the Senate, one early target he may aim for is so-called off-label promotion of prescription drugs. The Obama administration issued tighter restrictions on how companies could market drugs for conditions not mentioned on drug labels — signifying the lack of FDA approval for that cause. Gottlieb has been highly critical of the Obama rules. Gottlieb has many possible financial conflicts that could feature prominently in his confirmation hearings. He serves on advisory boards for several major pharmaceutical companies. "Gottlieb is entangled in an unprecedented web of Big Pharma ties," says Dr. Michael Carome, the director of Public Citizen's Health Research Group, a pro-consumer advocacy group. "He has spent most of his career dedicated to promoting the financial interests of the pharmaceutical industry, and the U.S. Senate must reject him." According to the ProPublica website Dollars for Docs, Gottlieb received more than $400,000 between August 2013 and December 2015 in promotional talks, research, consulting and travel while practicing at Stamford Hospital in Connecticut. As FDA commissioner, Gottlieb would oversee an agency that has regulatory power over a quarter of the U.S. economy, including not just pharmaceuticals but medical devices, food safety, cosmetics and other areas of human and animal health.